Length: estimated between 30-37 metres. Turiasaurus is a big sauropod dinosaur from Spain. It is so far Europes biggest dinosaur. The animal was huge, with a very big tail and a body, that was surprisingly light: the whole animal is estimated to have had a weight of just 40-48 tons. This is very light in comparison to other giants like Puertasaurus and argentinosaurus(both from south america), which were more or less as long as turiasaurus, but maybe more than 2 times heavier! Turiasaurus shows some unique features and as it couldnt be placed in any of the sauropods family, Turiasaurus as well as galveosaurus and losillasaurus got its own family: The Turiasauria. Some fragmentary remains from other england may also belong in this clade. The fact, that Turiasaurus was so big proves that not only diplodocids and titanosaur could reach humongos sizes. 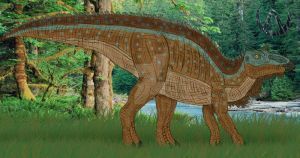 Turiasaurus is known from a relatively complete skeleton. Newer studies also reconstructed the head. Very good work! The length of 34m seems a bit excessive (28m is more like it) but overall very well-done composition anatomy-wise. I don't know what the whole animal looked like, but there is a skeletal floating around the internet which shows a short neck and most of the animal's length being the tail. Wait a second, where did you find the info about the skeleton? There are some pics of the holotype. sieht aus wie ein camarasaurus.